My first overseas trip of 2014 has wrapped up after the European Championships finished yesterday in Croatia. I am now on my way home, currently in Dubai in transit about to begin the long haul back to Auckland via Melbourne. Thanks to everyone for the continued support! There has been a slight lack of blog updates over the past month, but be sure to follow me on Facebook https://www.facebook.com/AndyMaloneySailing?ref=hl as I update that much more regularly while training and competing. The following letter from YNZ introduces insurance packges they have negotiated for yacht clubs with AON. Pupuke Boating Club hosted the 2014 Fresh Water Champs over the weekend of 17 and 18 May. The regatta was well attended with 40 boats, 26 in the full rig class and 14 in the radials. It was classic autumn conditions on the Saturday with a relatively steady 15-18 knot breeze from the south. With a relatively short start line there was a real emphasis on clear air and having the ability to get on the right side of the first shift in order to stay at the top of the fleet. Andrew MacKenzie from Kohimarama Yacht Club showed his intensions early in the full rig winning every race on the first day. The competition for the remaining places in the top ten was very tight with many of the sailors exchanging places during the first day. In the radial fleet Scott Leith continued his dominant form on the first daywith his closest completion coming ftrom James Jennings and Richard Blakey. Sunday dawned cold, crisp and sunny, had no real breeze to speak of. The race committee was fortunate enough to get away one start late in the day. This was very much a light air affair with thin veins of pressure providing good rewards to those who were able to keep their heads out of the boat. The final race on the Sunday allowed each sailor to drop one race so in the end it was the results on the Saturday that largely determined the results. The Pupuke Boating Club again enjoyed very generous sponsorship with a well attended prize giving with great spot prizes up for grabs. All in all it was another great weekend and Pupuke Boating Club is looking forward to hosting the event again in 2015. Sam Meech has won Gold at the 2014 Delta Lloyd regatta in Medemblik Holland. 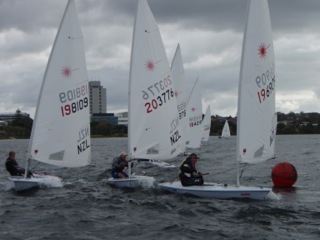 And Mike Bullot's bronze vaults him back to the front of the elite Laser sailors after many years away. with Thomas Saunders 5th and Andy Maloney sixth. Across in the womens fleet Sara Winther was 11th. Make sure to keep following my Facebook page AndyMaloneySailing for more regular updates while I am over here in Europe for the next couple of months! Andy Maloney has got a Silver medial in the ISAF World Cup in Heyres, France. He had a good chance for gold with a final race battle against Aussie Tom Burton. He comments in the sailworld.com article linked below. Sam Meech held onto 9th overall. Those top 10 results are important for determinging the support each sailor gets from APRC via Yachting NZ. Thomas Saunders was 15th and Andrew McKenzie 97th. Over in the Radials Sara Winther was 18th and Ali Nightingale 64th. Congratulations to Lachy Grimwade who has won in the 17 boat Laser 4.7 fleet at Sail Brisbane. A closely fought battle and nerve racking result, which Lachy won on countback after tying on final points with James Woodhouse and one point back to Noah Taylor. Looking forward to a week of training here in Palma before heading to Hyeres and getting into the build up for the next World Cup event there. Thanks to all those who attended. Particularly the judges John Bullot and Doug Elder who gave us a very helpful perspective on a number of issues.